Emissions at the Port of Long Beach have continued to decline as the port progresses toward updated clean air standards, officials said this week. The port recorded across-the-board reductions in diesel particulate matter, nitrogen oxides and sulfur oxides. All three toxins are focus points in the original Clean Air Action Plan which was updated in November 2017. The figures are part of the 14th annual report on emissions, which was instituted after the ports of Los Angeles and Long Beach first adopted their Clean Air Action Plan in 2005. The report uses emissions levels data from 2005 as a baseline. Sulfur oxides decreased by 97 percent, and diesel particulate matter by 88 percent; emissions in those two categories have now already exceeded the 2023 reduction standards laid out in the clean air plan. Nitrogen oxides are within 3 percent of reaching the 2023 reduction standard of a 59 percent decrease from 2005 levels. The report attributed these decreases to a number of factors, including the average age of diesel trucks moving goods in and out of the port dropping from 11 years old to five years old, as well as a decrease in idle time due to gate automation improvements, which the report said has led to a drop of about 1.45 million idle hours. 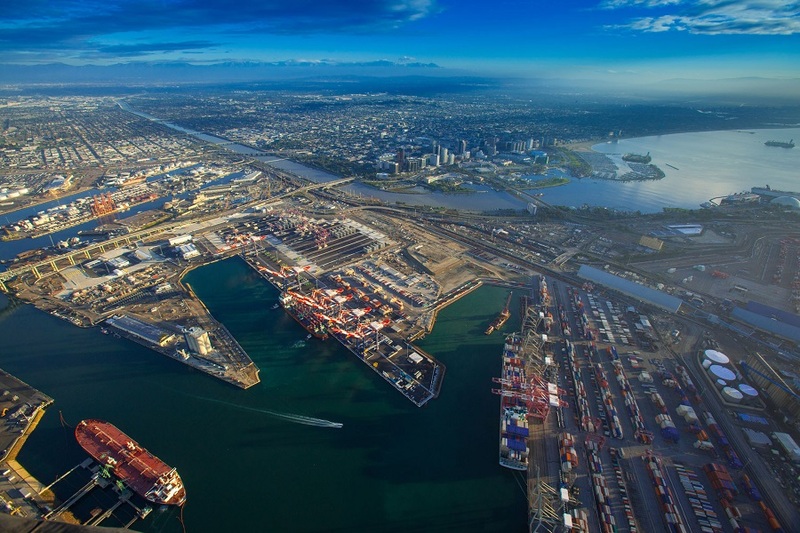 Moving goods by on-dock rail and improvements to cleaner cargo handling equipment—like the technology found at the automated Long Beach terminal—have also helped shrink goods movement sector to one of the smallest sources of emissions at the port. Ocean-going vessels continue to be one of the largest sources of pollution at the port. Director of Environmental Planning Heather Tomley said the port is looking at a variety of ways to address that going forward, including charging a fee to older, less clean ships that currently make calls at the port. The port already has programs focused on slowing speeds and promoting green ships, but a fee could help pressure operators to make the switch. The port is also expecting larger ships to dock in the future, which is one of the reasons the new Gerald Desmond Bridge is taller than its predecessor. Tomley explained that larger ships also tend to be newer, which means less emissions. Trucks will soon be subject to a fee, something the port is already in the process of identifying, Tomley said. The idea of the fee for cargo trucks was introduced and adopted under the updated clean air plan and the port is in the midst of an economic study that is part of a process that will lead up to a fee being in place in 2020. The fee, like the one the port could consider for ocean-going vessels, is meant to provide an economic incentive to trucking companies to convert to near-zero or zero emissions rigs as the port pushes toward its new emissions goals by 2035. But Tomley said a number of things have to happen before fees can start being assessed. The port will also have to create a mechanism to collect those fees, something that is currently not in place. As cargo volume continues to increase at the port, the emissions reductions seen over the past few years may be hard to maintain. The report noted this, but concluded that while the rapid rate in reductions may taper off, the port should be able to meet its clean air goals. Tomley said that those goals were developed with increased cargo growth in mind and that the port would continue to address emissions levels at the port by looking to implement cleaner technologies as they become available.